Autumn is a season that is traditionally associated with change and transformation, a transition from the fulfillment of summer to the dormant and hibernating state of winter. A world of green changes to a vivid landscape of orange, red, rust, and gold leaves and flowers. Fall pumpkins and apples seem to be everywhere. As the last fruits of the season are harvested, everything outside withers and decays, turning to dust and going back to the earth to be recycled for the next harvest season. It is a time of endings, death, and dissolution, the end of the journey through the wheel of the year. The two main autumn festivals celebrated on the wheel of the year are the Autumn (or vernal) Equinox and Samhain. Autumn Equinox/Mabon: Usually occurs around September 21st or 22nd. Also known as Mabon, and named after the Welsh God of the same name. The time of the Autumn Equinox falls around the second harvest of the growing season. It is a sunset festival, celebrated at dusk, when the daylight is waning and turning to night. The theme of Mabon is one of thanksgiving as well as old age and the fulfillment or completion of purpose and intention, the transition into a resting period after an extended time of activity. In Neopagan mythology, the Autumn Equinox is a time when the sun god prepares to die and leave the physical plane of existence, while the goddess mourns him. She herself ages and withers and prepares herself for sleep, just as mother earth prepares for hibernation as the sun cycle begins to change. 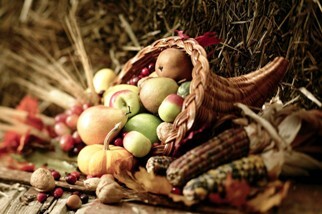 Mabon is celebrated with apples, cider, nuts, berries, grapes and wine. Cornbread and cakes are prepared and decorations can include pine cones, acorns, gourds, chrysanthemums, and cornucopias or horns of plenty filled with the fruits of the harvest season. 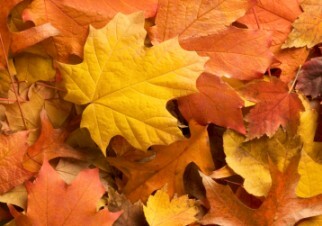 Fall colors are abundantly gold, orange, red and brown – reflecting the changing colors of the leaves on the trees. Samhain/Halloween/All Hallow’s Eve: October 31st–Nov. 2nd: Samhain, (pronounced souw-an) is an Irish word that means November in Gaelic, and refers to the end of summer. Samhain is the final harvest of the growing season and is associated with the apple harvest. The final fruits of the year are picked to be stored for the coming winter months. The theme of Samhain is the mystery of death and the transformation from one reality to another, from the physical to the non-physical world beyond the senses. The emphasis is on reaching out to a deeper reality and all which exists beyond our everyday sense perceptions. In Neopagan mythology, Samhain is a time when the Sun God dies and travels to the underworld until he is reborn at Yule. Samhain is celebrated in a myriad of ways, depending on the tradition. Decorations can include carved pumpkins and jack-o-lanterns, bats, witches brooms, ghosts and skeletons, colors of orange and black, witches cauldrons, black cats – all the traditional symbols associated with Halloween and trick or treating. Traditional activities include leaping through or dancing around a burning bonfire, bobbing for apples, and scrying. Foods enjoyed are pumpkin bread and pie, pumpkin seeds, apples, apple pie and apple cider. Historically, Samhain is an ancient fire festival celebrating the end of the harvest season and the honoring of the dead. In contemporary times, Samhain is also associated with Halloween, which has Christian origins in the festival cycle known as All Hallow’s Eve/All Soul’s Day or Hallowmas, a celebration to honor the dead. In Mexico, Hallowmas is called Dia de Los Muertos, or the Day of the Dead.